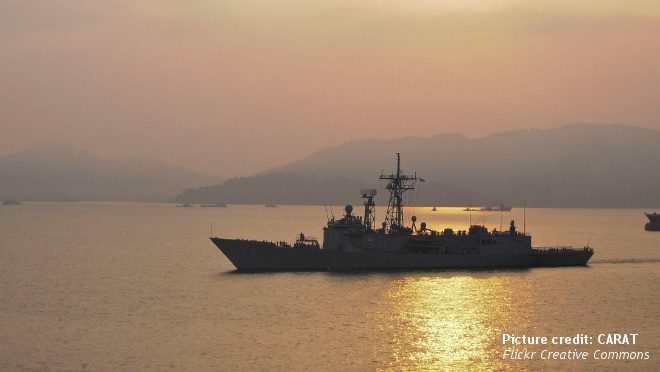 While China is actively seeking to diversify energy routes to reduce its dependence on the Straits of Malacca, the strategic waterway still remains a safer bet than other untested alternatives, argues B.A. Hamzah. The Straits of Malacca and Singapore are one of the most vital sea lines of communication in the world, constituting the principal passage from the Indian Ocean to the South China Sea. More than 30 percent of the world’s seaborne trade passes through this narrow 500 nautical-mile-long waterway. Apart from serving the strategic needs of the riparian states, China, Japan, and South Korea are reliant on this strategic waterway for their supplies, especially energy. Despite increased imports through Russia and Kazakhstan, China remains heavily dependent on Middle Eastern oil, with up to 80 percent of its energy supply passing through the Straits. Having little control over the passage, any disruption – ranging from piracy to fears of a potential naval blockade by the United States and its allies – will have an adverse impact on China’s long-term food and energy security. As part of its Belt and Road initiative, China is developing several major new routes that are likely to reduce China’s dependency on the Malaccan Straits as a conduit for oil imports. One route is China’s trans-Myanmar oil and gas pipelines. A gas pipeline was already opened in 2013 while construction of its sister oil pipeline between the Port of Sitwe in Burmese waters and Kunming in China’s Yunnan province was completed in 2015. It is estimated that some 22 billion tonnes of crude oil and 13 billion cubic feet of gas will pass through the pipelines annually. Second, the Pakistan-China Economic Corridor is a development project to link Gwadar Port in southern Pakistan to China’s north-western region of Xinjiang by means of highways, railways, and pipelines. When completed, China will be able to use this land-bridge to transport supplies from the Persian Gulf. Apart from these routes, there are proposals to develop two land-bridges – including an oil pipeline and a railway – linking ports on the west and east coasts of the Malay Peninsula. Beijing is funding these projects with the intention of bypassing the Strait of Singapore – the narrowest chokepoint of the Malaccan Straits. A further route, still under discussion, is the proposal to construct a canal across the Isthmus of Kra in southern Thailand. Although the canal project has not become officially part of the Belt and Road initiative and has encountered political resistance, there are unconfirmed talks between commercial parties in China and their counterparts in Thailand. China has also expressed interest in Arctic shipping routes along the Northern Sea Route and through the Northwest Passage, though their feasibility amidst challenges of climate and lack of infrastructure, among others, remains uncertain. No one knows exactly how much oil and gas will go through the alternative routes and how much time they will take to reach their final destinations. Other question marks include insurance charges and storage facilities. Thus, the relative economic costs vis-à-vis the Malaccan Straits – even if physical distance is reduced – remain to be seen. Perhaps more pertinent still is that the security of the pipelines and land-bridges of the alternative routes is untested. Unlike passage through the Straits of Malacca which is governed by international law, the legal regime on land will be subjected to national laws as well as vulnerable to potential instability – Myanmar’s restive ethnic regions being a case-in-point. The international legal regime at sea is more predictable and more elaborate compared with the domestic legal regime applicable on the alternative land routes. The United Nations Convention on the Law of the Sea (UNCLOS) establishes a regime of transit passage in strategic waterways that make it illegal for riparian states to hinder passage or impose levies on passing vessels. Furthermore, apart from a well-established insurance and reinsurance regime, the ports along the Straits of Malacca and Singapore provide excellent repair and bunkering services that are likely to take time to replicate on land. China is in fact expending considerable investment in the Straits. Notable infrastructure and mixed development projects include the off-shore Melaka Gateway and Forest City projects – both joint ventures with Malaysia. Boosting bilateral ties and trade between the two countries, critics point to China seeking to consolidate its strategic access over the Straits. Once completed, the China-proposed and funded Belt and Road projects will undoubtedly alter the traditional trading routes in the region. However, just as in ancient times, the Malaccan Straits will continue to remain a key focus for China in the foreseeable future. B.A. Hamzah is a lecturer at the Department of Strategic Studies of the National Defence University in Kuala Lumpur, Malaysia.